¿No seguimos el mismo camino juntos? I would like to share with you two experiences of God where flowing life and the miracle of God’s grace in Christian community healed my self doubt and embraced me on the camino, the way. I hope these stories will invite you to entrust your experiences of God to others and to listen with an open heart to their stories. ¿Estás casado? Are you married? asked Javier (name changed) two minutes into our conversation in Spanish about our interest in ministry to Latino communities. “No.” I lied. I was afraid that my yes and revelation that I was married to my husband and partner of fifteen years would cut off any further communication based on my own assumptions about Latino culture and tradition. I had already decided that being gay would just not work in this context. I recovered explaining how I actually was married but not in this state because my marriage granted in Maryland was not recognized here. Here is my wounded vulnerable self. “¿Me aceptas? Do you accept me?” I thought looking into Javier’s eyes. “Es difícil ser gay en la iglesia. It’s difficult to be gay in the church,” I added summarizing the cacophony of real voices I had heard ringing in my ears. They were shouting: “How will you as a gay man minister to 90% of the population who isn’t gay? This congregation does not want any LGBTQ students for contextual education. You will face limitations and long waits for first call. Bound conscience. We don’t need to be Reconciling in Christ, because aren’t we already there?” Javier understood difícil, difficult, in a deep way from his own experience of poverty, immigration, and hard work for the life he and his wife wanted for their family. In the moment, I was blinded to my own white male middle class privilege by self-absorption and lament. Javier responded with compassion. His steady voice broke through the cacophony, “Somos todos hermanos en Cristo. We all brothers and sisters in Christ. ¿No seguimos el mismo camino juntos? Aren’t we all following the same path together?” He smiled. Our walking together came with the invitation to minister with Javier in giving his sermon at the final worship. Javier invited me to translate his sermon using the birthing imagery from the encounter between Jesus and Nicodemus in John 3 to explain his understanding of the relationship between the Father, Son, and Holy Spirit as an umbilical cord. This eternal current of life in the Trinity is similar to the blood, oxygen, and nutrients that flow through the umbilical cord that connects developing babies to their mothers and us to God. As we worked together, Javier shared his experience of God that is both his immigration and conversion story. Joined by our baptism into Christ, paragraph by paragraph we preached his sermon to our group in the languages of both of our hearts. Señora Soto shared her camino, her road, with me that is the story of El Señor de los Milagros, The Lord of Miracles. She told me this story: In 1550, an indigenous woman asked her priest for a crucifix for her home that she could use for her daily devotion. He told her it would cost seven gold coins and would need to be ordered from Spain. The faithful woman worked hard for a long time and saved this small fortune. The day she was going to the priest with the money, her neighbor was thrown in jail because he could not pay his debts which amounted to seven gold coins. The man’s family would starve without the income he earned from his work. The faithful woman responded with compassion to her neighbor’s suffering and gave the creditors the seven gold coins to pay his debt. Time passed and the faithful woman started over saving for her crucifix. She was down washing clothes at the river after a heavy rain had made it swell. To her surprise, the swift current brought a small crucifix downstream to the faithful woman. She brought it home, put it inside a wooden box frame for an altar. That night, she awoke to the creaking and splintering of wood. The crucifix had expanded in size and burst through the frame. Nearly five centuries later, people in Central America and throughout Spanish-speaking countries attribute healing to El Señor de los Milagros. This story is remembered and people testify to the healing in their lives on the fourteenth of every month with a special Mass at the basilica. At her request, I added her name to the list for Catholic communion. I cried for Mrs. Soto. I mourned her loneliness and isolation because of the language barrier, her illness, and her distance from family. I felt her pain at not being able to receive this physical and spiritual gift of nourishment and connection in the sacrament of communion that means so much to both of us. I prayed for her. On Monday, we read the words of the Mass that I found posted on the basilica’s website. She confirmed that the Catholic ministers did bring her communion on Sunday. The day I met Señora Soto was the thirteenth. She received communion on the fourteenth of June, the Día de El Señor de los Milagros, Day of the Lord of Miracles. “¿Cree en milagros, Señora Soto? 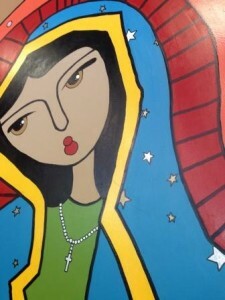 Do you believe in miracles, Mrs. Soto?” “Sí,” she affirmed with a beatific smile. So do I. What are the cacophony of voices that try to smother your joy and belonging in Christian community? Where is the life giving connection of experience of God’s grace in your life? 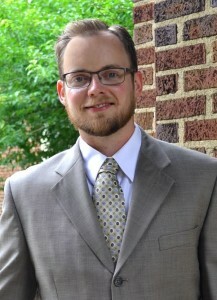 Justin Ferko is entering his second year at Trinity Lutheran Seminary where he is part of the development of Trinity’s Spanish for Ministry program and is the 2015-2016 Proclaim representative. Honored to have received the Joel R. Workin Scholarship for 2015, Justin plans to further discern his call to minister with communities whose voices need to be heard, particularly immigrant communities and people experiencing homelessness. Justin plans to attend a January Term course offered by the Seminary of the Southwest to learn about Hispanic culture and models of intercultural ministry that serve and empower immigrant and historic Latino communities along the U.S. – Mexico border. This entry was posted on Wednesday, July 8th, 2015 at 8:48 am	and is filed under Blog. You can follow any responses to this entry through the RSS 2.0 feed. Both comments and pings are currently closed. Love this! Thank you for sharing!! God Bless you on your journey!